Inserted on the International Day for Monuments and Sites, April 18, will be free visits to the early Christian basilica in the Tróia Roman Ruins, in the county of Grândola. This complex has accessibility for wheelchairs users. 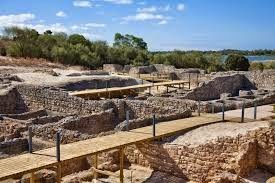 The Early Christian basilica built around the fifth century, one of the oldest in the Iberian Peninsula, is placedein the Tróia Roman Ruins, who form the largest complex of salting and preserve known in the Roman World. This building stand out geometric patterns, marbled with natural motifs, very present in ancient Christian culture. On this day, between, 4 pm and 5:30 pm will be possible to visit for free the basilica and complex. This archiological complex as a accessible footpath to people in wheelchairs. The International Day for Monuments and Sites was established by ICOMOS (International Council on Monuments and Sites) UNESCO member. Under the theme “Monuments and Sites: Meet, Explore, Share” will take place throughout the country initiatives shall inform the public several monuments and events that will be possible to visit for free. The objectiv of this day is to raise awareness of diversity and vulnerability of heritage and to the effort involved in its protection and recovery. Included in the International Day for Monuments and Sites event held a presentation “The Mural Painting of the Tróia Basilica”, at 15:00, at the Clubhouse of Troia Golf, which will be attended by representatives of the New University of Lisbon and company Wall History, responsible for the restoration work of the paintings. The preservation of Trojan Roman ruins several are involved several entities: the owner of the land where Sonae Capital lies the archaeological complex, the Administration of Setúbal and Sesimbra Ports (APSS) – that since 2014 supports the conservation and restoration work on Basilica – and Buehler-Brockhaus Foundation.